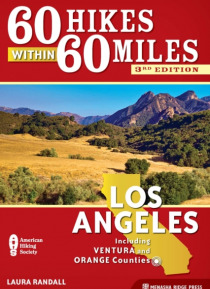 60 Hikes Within 60 Miles: Los Angeles shows readers how to quickly drive to and enjoy the best hikes from the San Gabriel Mountains to the Pacific Ocean.With time, health, and pin money at a premium, this handy guide helps Angelenos get back to nature without going out of town. From Palos Verdes on the coast to Santa Clarita to the north and the expansive San Gabriel Mountains, it details 60 hike… s and walks within roughly an hour's drive of Los Angeles, encouraging even the most time-starved trekkers to get on the trails and get healthy.Extensive at-a-glance information makes it easy to choose the perfect hike based on length, difficulty, scenery, or on a specific factor such as hikes good for families, runners, or birding. Each trail profile includes maps, directions, driving times, nearby attractions, and other pertinent details.Having lived in just about every area of Los Angeles, author Laura Randall provides key in-the-know information about traffic patterns, the best times to hike, how to avoid expensive parking fees, and the best burrito joints near the trail-head.